Anil is survived by his wife, Rani, and three children, who live in Dabri Extension. Rani told the Indian Express that her husband was the only earning member of the family and earned "enough to make ends meet". 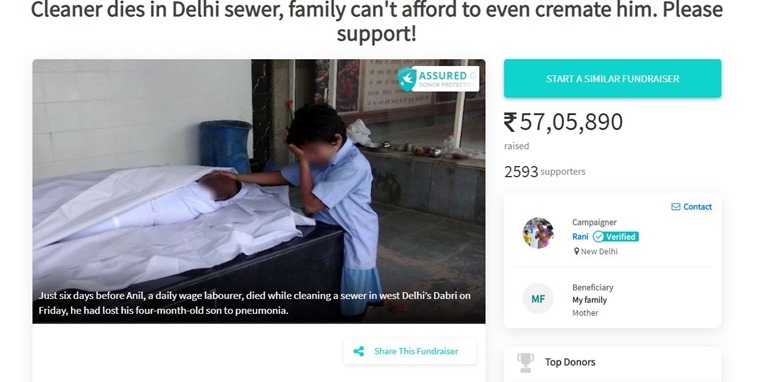 A photograph has helped raise over Rs 50 lakh for the family of a sewage worker who died after allegedly inhaling toxic gases, in Dwarka’s Dabri Extension in the national capital late Friday evening. A journalist with Hindustan Times posted a photograph of Anil’s sobbing son standing next to his corpse with a message that the family did not have money even for the cremation. After seeing the heartbreaking photograph, many Twitter users extended their support and asked how they could help. The journalist later shared the bank account details of Anil’s wife for donations. This also led to the setting up of a crowdfunding campaign on Ketto after the initiative of Rahul Verma, the founder of NGO Uday Foundation. The online crowdfunding website Ketto had set a target of Rs 24 lakh to be raised over a fortnight but within a few hours only, Rs 10 lakh was collected. According to the Ketto’s website, the fundraiser has collected over Rs 57 lakh by more than 2500 donors by Thursday morning. Anil, the 37-year-old worker, died on Friday, after a rope around his waist broke, following which he slipped into the 20-feet sewer. The police earlier told The Indian Express that Anil was not provided with any safety apparatus and the rope was unable to bear his weight. Anil was rushed to Deen Dayal Upadhyay Hospital where he was declared brought dead. Anil is survived by his wife, Rani, and three children, who live in Dabri Extension. Rani told The Indian Express that her husband was the only earning member of the family and earned “enough to make ends meet”. Their 11-year-old son started school last week and the family’s future is in jeopardy, said Rani. Just a week ago, Anil and Rani had lost their four-month-old child due to pneumonia. Data obtained by The Indian Express show that one person has died every five days while cleaning sewers and septic tanks across the country since January 1, 2017. This is based on a report by the National Commission for Safai Karamcharis (NCSK), which was set up for the welfare of the sanitation workers. Including Anil’s death, the last week alone accounted for six deaths in the National Capital Region.